Updated Sunday February 19, 2017 by SJWB. Are you ready for some serious fun!!! 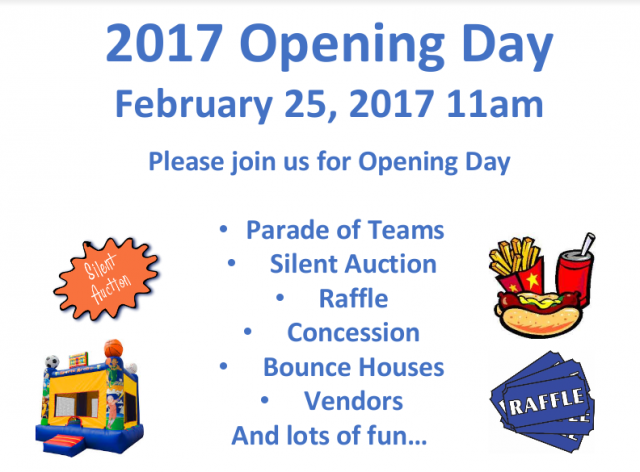 The OPENING DAY CELEBRATION is set for Saturday, Feb 25th. Touch-A-Truck with a Fire engine, Police SWAT Tank, and Police Hummer!!! A Dunk tank!!! Dunk your coaches!!! Silent Auction (12-2pm) with some SERIOUS Baskets!!! An AMAZING RAFFLE items including a hover board, a drone with hd camera, Beats headphones, a full size paddle board, signed sports memorabilia and more!!! Tons of fantastic food including Mikes Pizza, Smoked Pork sandwiches, Kona Ice, and more!!! A 12U Majors division exhibition game!!! We cant wait to see everyone there!! !